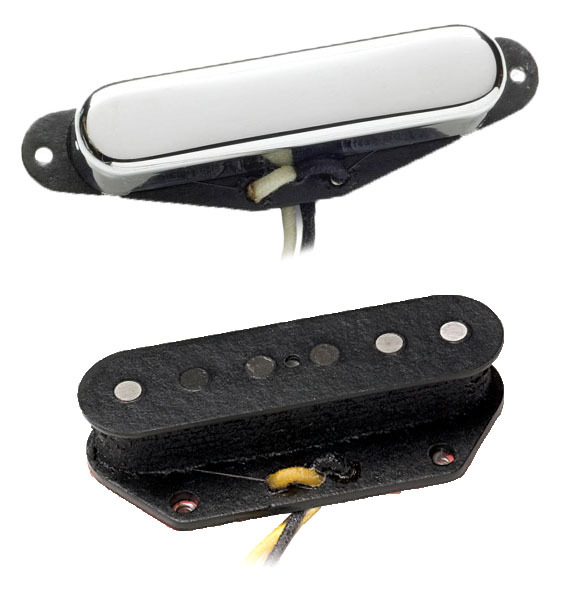 The Seymour Duncan STL-1S is a complete set of bridge/neck pickups for the Fender Broadcaster. This set includes the STL-1b Vintage Broadcaster Lead/Bridge Pickup and the STR-1n Vintage Rhythm/Neck Pickup. Recommended for traditional country, country pop, chicken pickin', rockabilly, blues, and blues-rock. The Seymour Duncan STL-1b is a vintage-correct reproduction of the Broadcaster Tele bridge pickup. The 1948 pre-Telecaster pickup had an exceptional twangy, "nasal" sound with tremendous sustain. Leo Fender called it the Broadcaster. The STL-1b duplicates this sought-after vintage sound with larger-diameter (.197") pole pieces in a flat pole piece orientation. Compared to the Vintage '54, this pickup has slightly more output and more snarl in the mids. Comes with waxed cloth hookup cable. The Seymour Duncan STR-1n is a vintage-correct reproduction of 1950s Tele rhythm pickup. Great for traditional country, country pop, surf, rockabilly, blues, and blues-rock. The rhythm (neck) pickup in a well-balanced vintage Telecaster compliments the bright twang of the lead pickup with a smooth and open tone, warm lower-mids and airy highs. Comes with a chrome-plated brass cover and waxed cloth hookup cable. Players include Duke Robillard, Seth Yacovone, Jodee Frawlee / Starr Faithfull, Al Anderson / Wailers & Lauren Hill, Adam Gaynor / Matchbox 20, Doug Pettibone / Lucinda Williams.